Welcome to the website of the Domain Adaptation challenge! 10.05.2014: Processed submission results are released. The winner is the XRCE (Xerox Research Centre Europe) group. The amount of freely available and annotated image collections is dramatically increased over the last years, thanks to the diffusion of high-quality cameras, and also to the introduction of new and cheap annotation tools such as Mechanical Turk. Attempts to leverage over and across such large data sources has proved challenging. Indeed, tools like Google Goggle are able to recognize reliably limited classes of objects, like books or wine labels, but are not able to generalize across generic objects like food items, clothing items and so on. This problem is known in the literature as the domain adaptation challenge. Addressing this issue would have a tremendous impact on the generality and adaptability of any vision-based annotation system. Current research in domain adaptation focuses on a scenario where (a) the prior domain (source) consists of one or maximum two databases (b) the labels between the source and the target domain are the same, and (c) the number of annotated training data for the target domain are limited. The goal of this challenge is to push the state of the art towards more realistic settings, relaxing these assumptions. In the 2014 edition, we will focus on the assumption (a), with the number of source data will range from 2 up to at least 5. Participants will be asked to build recognition systems for the target classes by leveraging over the source knowledge. Source data will be provided by exploiting existing available resources like the ImageNet, Caltetch256, AwA databases and so on. Target data will be collected from the Web, using existing tools like Google Image or Bing. Performance will be measured in terms of accuracy. The submissions will be received through the ImageCLEF 2014 system, going to "Runs" and then "Submit run" and select track "ImageCLEF2014:domain-adaptation". Task specific submission instructions and runs format can be seen here. In this year edition only one task will be considered, where participants should be able to classify images in the target domain by leveraging labeled source data. Caltech-256, consists of 256 object categories with a collection of 30.607 images. 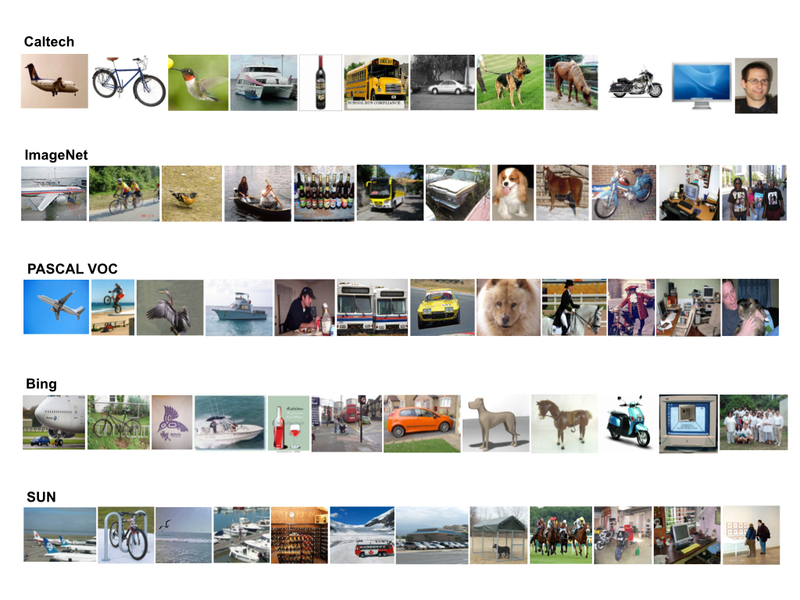 ImageNet ILSVRC2012, is organized according to the WordNet hierarchy, with an average of 500 images per node. PASCAL VOC2012, is image data sets for object class recognition with 20 object classes. Bing, contains all 256 categories from Caltech-256 and is augmented with 300 web images per category that were collected through textual search using Bing. SUN, is scene understanding database that contains 899 categories and 130.519 images. The organizers randomly select 50 images per class, with total 600 images for each source. Each formatted file consists of 600 extracted image features written in text file and a label file. The organizers use SUN dataset as target data with 5 images per class for training data and 50 images per class for testing set. Each image is represented with dense SIFT descriptors (PHOW features) at points on a regular grid with spacing 128 pixels. At each grid point the descriptors are computed over four patches with different radii, hence each point is represented by four SIFT descriptors. The dense features are vector quantized into 256 visual words using k-means clustering on a randomly chosen subset of the Caltech-256 database. Finally, all images are converted to 2x2 spatial histograms over the 256 visual words, resulted in 1024 feature dimension. The software for image extractor is available at www.vlfeat.org. Image Classification using Random Forests and Ferns, A. Bosch, A. Zisserman, X. Munoz, IEEE International Conference on Computer Vision, 2007. For each image, participants have to provide the class name. The result will be compared with the truth label. For each correctly classified image will receive 1 point. For each misclassified image will receive 0 point. Each line in the result file should represent a classification for a single image, with the following format: <number> <class_name>.